Please help bring this little guy home to his parents. He’s been missing since September, and his parents are understandably frantic. been in Davidson MI, Bristol and Irish Rd. Neutered Male. 12 inches tall. 2 inch stub tail. Standing Bat Ears. Call Any hour with any sightings. PLEASE PICK HIM UP AND CALL IF FOUND!! around town, and some surrounding towns, however he is still not home. 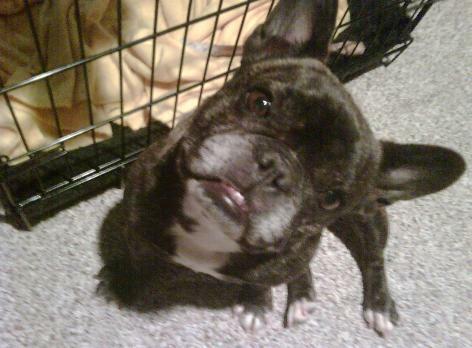 A Chicago area French Bulldog is missing, and volunteers urgently need your help. Shelley is a seven year old, spayed brindle French Bulldog. She has a white chest. A photo is coming soon. Shelley has been misssing since 11:15 am on New Year’s Day, from the rear of a house located on Woodland Drive, in Plano, Illinois. She was not wearing a collar, and is not microchipped. Her foster mom let her out for a pee, and Shelley took off into the woods. She has not been seen since, and it is cold in Plano, and getting colder. Please – if you are in the Plano area, and able to assist with searching for Shelley, call Mary Scheffke at (773) 931 4860. If you are anywhere in this area, please keep your eyes open for Shelley. It can be surprising how far and how fast small dogs can travel when they are scared and disoriented. Most Frenchies will seek out human companionship, happily getting into cars or going inside houses. Look for neighbours who might have found a dog recently. Check CraigsList and Kijiji for notices of found dogs – occasionally Frenchies are listed as Pugs, Bostons or cross bred dogs. Please spread word about Shelley on Twitter, Facebook and other blogs. 8 hours out there today with 2 dogs trying to track her- several volunteers- some hunters helping us- can’t believe a 7 year old frenchie got far! No fresh kill from coyotes in a 5 mile radius of our search. We have hire findtoto.com- they call neighbors in a certain mileage radius and ask if they have seen the dog and to watch for it-no luck yet. Praying that someone found her yesterday in daylight and are waiting for the holidays to call the police, vet or shelter- as she is friendly and would probably go to a house or people if she saw them- many houses and farms nearby the wooded area she took off in.